Many moms and dads feel pressured to offer structured programs and activities for their kids, perhaps in fear of them becoming bored. But by over-programming and over-scheduling our children’s days we may actually be doing them a disservice. Research shows that little ones make great leaps in development when they are free to play and explore independently. Play is necessary for a child to develop socially, emotionally, physically and intellectually. 1. Spend time outdoors in your backyard, at a park or even in a field, so your children have the chance to run around and connect with nature. The more they love spending time outdoors the easier it will be to pull them away from the TV. 2. Encourage active play to keep your child fit and healthy. Physical activity can involve individual and team sports as well as unstructured play to promote the use and development of large muscle groups. 3. Allow your children to get messy and help them to experiment with different textures, colours, scents and sounds. 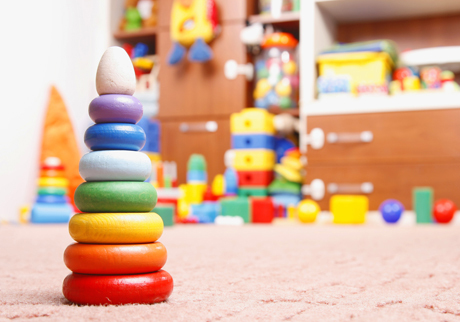 Household objects, like pots or an assortment of hats, can be used to encourage creative play. 4. Encourage your child to find multiple uses for the same toy. A block can be something to build with, or it can be an airplane, car and boat. A plastic plate may be something to eat off of, or a fancy hat and even a Frisbee. 5. Allow free time for children to choose what they want to do. Encourage them to imagine their surroundings, dress up in costumes and make believe that they are anyone or anything. 6. Spend time completing puzzles, building with blocks and cutting and pasting, in order to encourage hand-eye coordination and fine-tune motor skills. 7. Invite other children over to promote cooperation, sharing and teamwork. 8. Allow your child some quiet time to daydream, doodle and read. 9. Provide your child with crayons, markers and paper and encourage their imagination to soar. Art doesn’t have to look like anything in order to be beautiful.